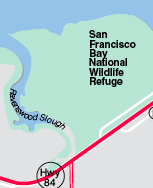 I called around to find out if the large loop trail just northwest of Dumbarton Bridge (Highway 84) that goes out toward Ravenswood point (in SF Bay National Wildlife Refuge area) was open or not. (Adjacent Ravenswood trail and salt pond area just south of the bridge is closed for restoration work until 2011.) Some maps show a large loop trail northwest of the Dumbarton Bridge, and some don't. I made some call s; no one knew. When I walked out there, I discovered this area is closed from October through January to the public -- open then only to those hunting for waterfowl. So, even though I walked around when it was not hunting season, and the views are nice (you can see the distant skylines of Oakland and San Francisco, Oracle buildings, ships coming into Redwood City, and the Dumbarton bridge), I would not recommend this as a hiking area at this time. Out at the point, I felt like I was the closest to the Bay I'd been so far. Small waves lapped up against broken chunks of concrete, brick and aggregate, and the water smelled more like ocean than baylands. Wildlife Sightings: 1 grayish grasshopper (? ); 1 ground squirrel; 1 flock of 20 birds (American avocets? ); 4 sandpipers; 1 dragonfly; and what I'm guessing was about 1/4 mile's worth of tiny ground gnats that hovered a few inches off the ground. I did not see any other humans, until I had to walk back along the short stretch of dirt trail near Bayfront Expressway (back to the public parking lot). Walking close to a busy road (a highway in fact), is another reason why I would not recommend this trail, especially for families.